18g have a 3mm ball and 3mm disc. 16g through 12g have a 4mm ball and 4.8mm disc. 10g have a 4.8mm ball and 4.8mm disc. 8g have a 5.6mm ball and a 6.4mm disc. 6g have a 6.4mm ball and a 7.2mm disc. 4g has a 8mm ball and a 8mm disc. 2g has a 9.6mm ball and a 9.6mm disc. 0g has a 11mm ball and a 11mm disc. 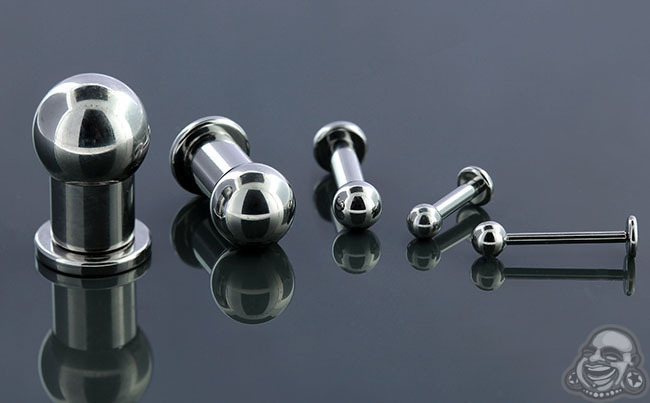 00g has a 12.7mm ball and a 12.7mm disc. Both the ball and back disc unscrew.